Have a question for Pems Pension and Restaurant? "The location was perfect as it is near a tourist spot and in that same place, just adjacent to the accommodation, there were series of small resto/cafe." "Lovely staff and very good food!" "The room was so nice and a little veranda for you to eat your breakfast." 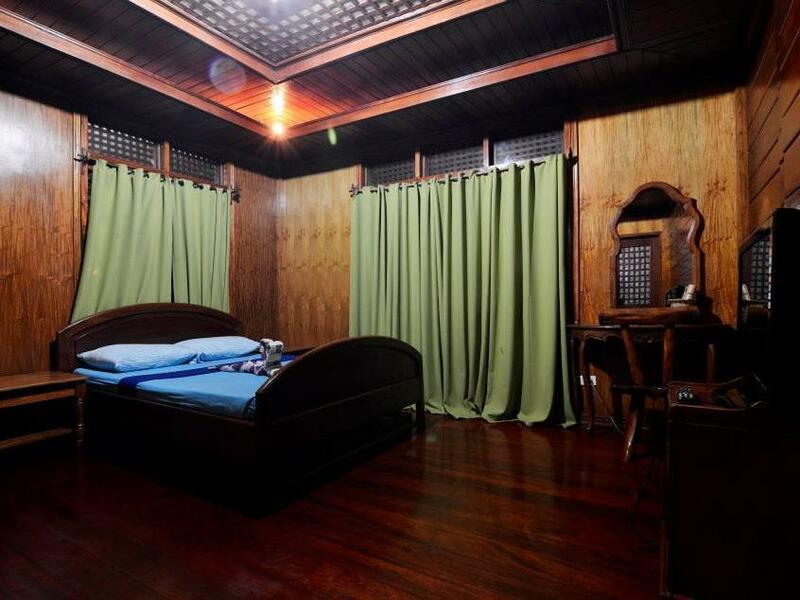 "The staff were really friendly, the room clean with a nice b..."
Conveniently located in Palawan, Pems Pension and Restaurant is a great base from which to explore this vibrant city. From here, guests can enjoy easy access to all that the lively city has to offer. With its convenient location, the hotel offers easy access to the city's must-see destinations. At Pems Pension and Restaurant, the excellent service and superior facilities make for an unforgettable stay. While lodging at this wonderful property, guests can enjoy 24-hour security, convenience store, daily housekeeping, ticket service, 24-hour front desk. 11 rooms spread over 1 floors provide a warm and pleasant home away from home. Modern comforts such as air conditioning, desk, balcony/terrace, fan, satellite/cable TV can be found in selected rooms. Whether you're a fitness enthusiast or are just looking for a way to unwind after a hard day, you will be entertained by top-class recreational facilities such as massage, children's playground, garden. Pems Pension and Restaurant is a smart choice for travelers to Palawan, offering a relaxed and hassle-free stay every time. "Good location ,excellent service and super clean"
It was very convenient to stay here as we were going to Apulit Island the next morning. The room was spacious but lighting somewhat ruined the mood as our toddler was very uncomfortable with it. Food was excellent and staff were friendly and attentive. Plus points as we changed to another room easily and had an quick transfer to the port. The location albeit not a top tourist spot in Palawan was very relaxed. Basic necessities were available in the town and going around was easy. It is though far from Puerto Princesa but just an hour an a half from El Nido. Pros: The bungalows are situated in very nice and clean garden surroundings. In the center close to Fort Santa Isabel but still in quiet surroundings. Cons: The wifi was not within range of our bungalow and the showerhead did not provide enough (only cold) water to wash out shampoo of the hair due to heavy lime scale. Lovely staff and very good food! The owner was over the top in hospitality! Good location, quiet, clean and spacious room. Nice wooden house and garden. Excellent service. The location was perfect as it is near a tourist spot and in that same place, just adjacent to the accommodation, there were series of small resto/cafe. The food there was acceptable although we were disappointed in some resto; but the halohalo at the far end resto was really good and it was cheap (50 pesos); just tell them not to put too much ice. Pems resto offered good food as well. Staff are very friendly and because of the spacious place with trees, you can easily buy bottle of wine and have a sip in the terrace. Nice stay. All the staff were nice ! Good breakfast also. Good value & clean we enjoyed our 1 night stay here. Our deluxe room looked over the fort a lovely view. The staff were really friendly, the room clean with a nice balcony and good food at the restaurant. we stayed here just for the night. taytay is pretty dull place with nothing much to do or see. staff is wery helpful though. The Staff was really Nice, honest and helpful With everything.. We will recomend Pems! The location is fantastic, the rooms are clean and well-kept and the staff are absolutely fantastic! On Google maps Pems is located next to the bus terminal (be careful as is actually in Centre of Taytay, 7 mins by tricycle). Value for money is outstanding and the staff went above and beyond to make sure we were happy. The manager Chan Lee is such a great guy- he took us on a day of island hopping with lunch included. word of warning: there are no places to get money out in Taytay (closest is El Nido) so make sure you factor that in! Hotel was kind enough to let us leave and pay later for the island hopping when we got back to Puerto Princesa through the Pawn Shop Highly recommend Pems! We only stayed only for one night but it was all good. we had Ac but no hot water. There was power outage and no Ac. Mosquitos are problem here. Grande chambre au calme, à proximité du centre ville. Ville très calme et loin des touristes. L'équipe est au petit soin, la météo n'a pas permis de faire une sortie sur 1 ile, du coup, le proprio a demandé à quelqu'un de son équipe de m'emmener en moto, faire le tour du lac! !